Photo by Richard Foreman Jr © 2012 Weinstein Co. All Rights Reserved. © 2012 Weinstein Co. All Rights Reserved. 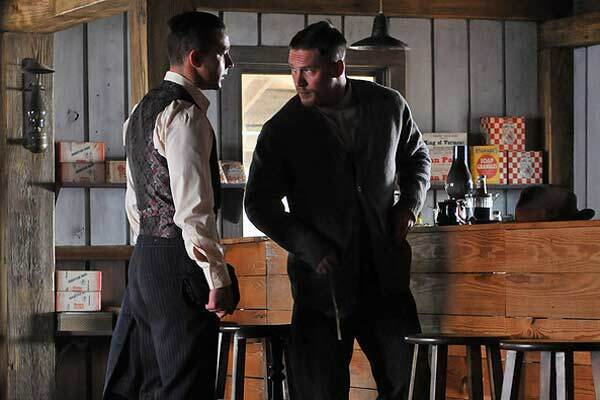 The true story of the infamous Bondurant brothers, LAWLESS portrays in epic depth the struggles, fortitude and bonds of three bootlegging siblings in the Prohibition-era, Depression-hit hills of Virginia. The brothers are the stuff of legend: Howard [Jason Clarke] survived the Great War, but not without damage; Forrest [Tom Hardy] nearly died several times, beating back death & life with a quiet strength, underlying ferocity and a seeming invincibility; Jack [Shia LaBeouf] is the youngest…smart, entrepreneurial and as of yet, untested. Their moonshine production has helped maintain the family’s remote home and business, Blackwater Station, but the outside world hits with intensity when lethal and corrupt Special Deputy Charlie Rakes [Guy Pearce] tries to take over the county. Inspired by his idol, gangster Floyd Banner [Gary Oldman], Jack starts his own bootlegging operation with backwoods mechanical genius Cricket Pate [Dane DeHaan], who pushes the envelope with inventive stills and the cars they drive to deliver their product. The brothers’ lives are further complicated by two beautiful women—the exotic yet steadfast Maggie Beauford [Jessica Chastain], who has a dangerous secret past, and the quiet, pious Bertha Minnix [Mia Wasikowska]. 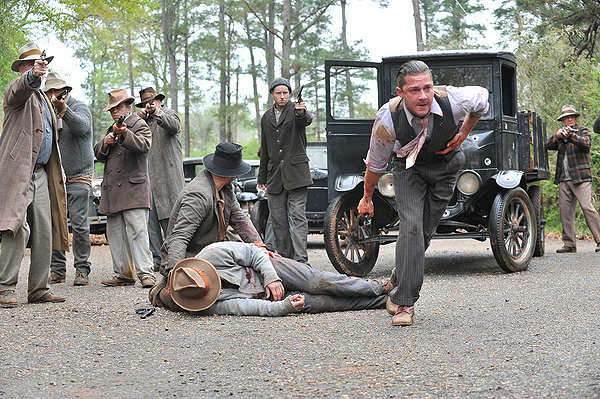 To re-create the Bondurants’ world, Franklin County, “where the hills glowed orange from the light of countless illegal stills,” Director John Hillcoat relied on Production Designer Chris Kennedy, Set Decorator Maria Nay SDSA and a devoted production crew who braved a winter ice storm and other unseemly weather to portray a historically accurate time and place. I think we all believed that Blackwater Station was much more than a set. It was a character in the movie as well. 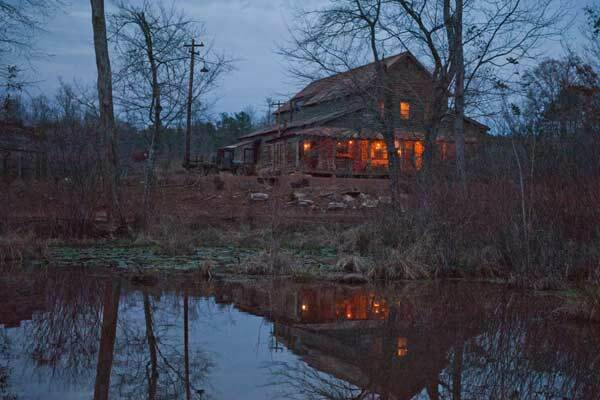 Production Designer Chris Kennedy found the property by driving the back roads of Georgia with Location Manager Andrew Ullman…they stumbled upon the land when he spotted the dam and the creek from the road. The vision of the place was that the family had settled the land long before our story transpired. 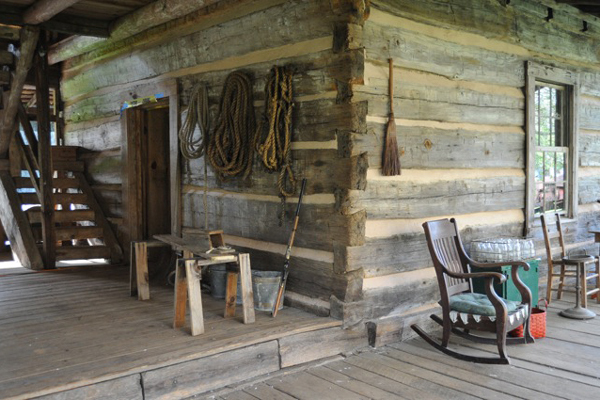 At the turn of the century, the boys’ parents had Blackwater Station set up as a rest stop…a combination of inn and diner where you could rest, get a good meal, water and shoe your horse or repair a buggy, and get your mail sent off. As time went by and roads were cut, the automobile was invented and the horse barn became a repair shop…a gas pump was put in. The boys still ran the diner, but didn’t rent rooms out anymore. We tried to honor that philosophy in building and dressing the station. Cricket’s garage was first completely dressed out as a livery and blacksmith shop, and then on top of all the livery stuff, as a repair shop/auto garage. We used oil-burning lamps and small elements of electricity in order to show some progress coming to the area. We put in one gas pump. We layered the outside with original metal signage, which also happened to be the real source of color amidst the very muted palette of earth tones. 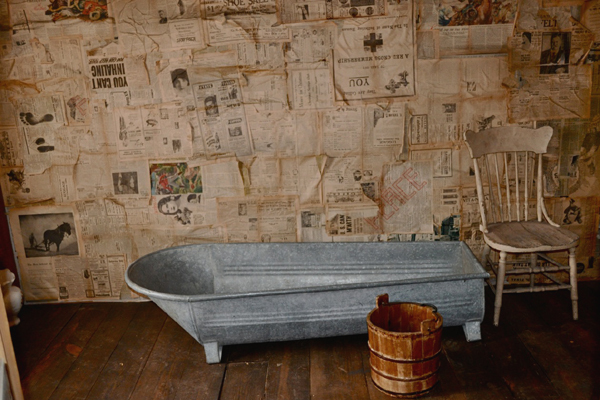 We used newspaper on the walls for insulation and it became organic and decorative. 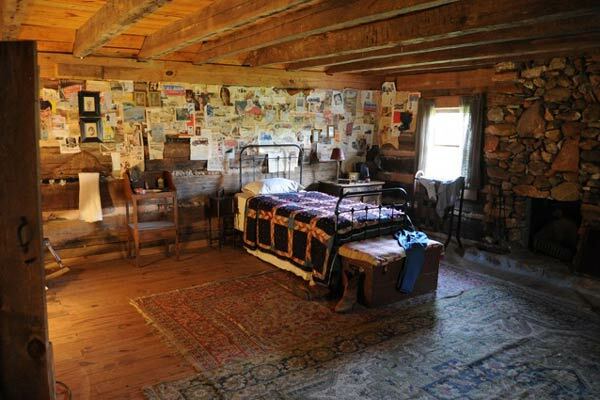 Old papers were hung and aged in, layer after layer, with progressively later dates as the layers overlapped. We reached out with really long tentacles to find enough newspapers, catalogs, personal photos and other appropriate bits. 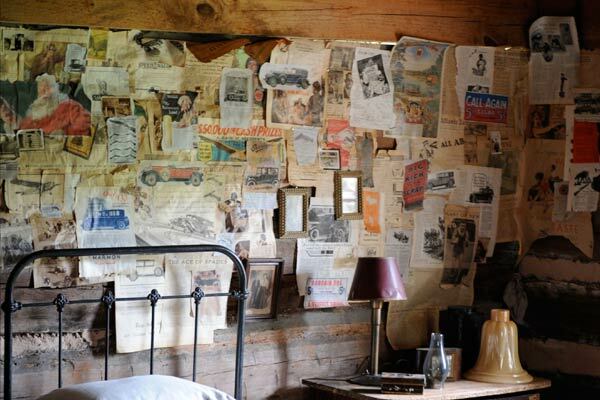 The collage in Jack’s room starts as insulation and morphs into a story about Jack and his life…his past, present and his dreams for the future. The amazing story behind the story of Blackwater Station is that we all got to Georgia seven weeks out from filming. 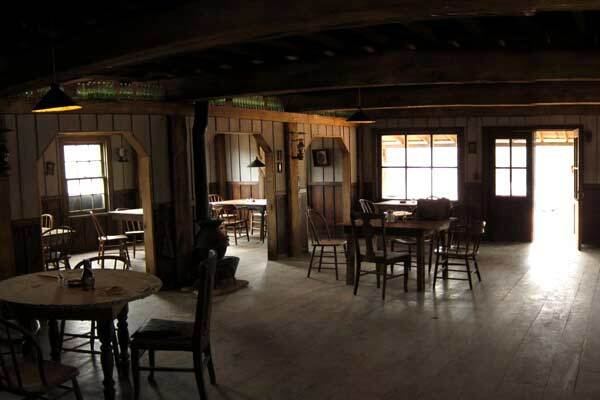 It was January, and we knew we would have to shoot the tavern and all the snow scenes at the beginning of the schedule, or we would miss the weather opportunity entirely. The week we were all hired, a great ice storm passed over Georgia and it was completely frozen. Airports and businesses just shut down. Construction couldn’t get trucks in and we couldn’t break ground or cut-in the road. We also got a week of pouring rain that slowed the process down. It was a real test of all departments working together so closely to get everything together on time. Essentially, Blackwater Station was designed, drawn, built, painted and dressed, road cut, electricity dropped and greens added in under seven weeks time. Chris, Director John Hillcoat and Writer/Musician Nick Cave have all known each other since college and always work together…they speak in a shorthand. They had a clear vision of what they wanted, it was very thought out. There were volumes of research that Chris had accumulated, so we were able to fly right out of the gate. I also had research from previous period films and was familiar with some of their reference material, so I was able to fall in pretty quickly. They were particularly keen on the organic colors of William Eggleston’s photography. Lots of photos of the depression were used from a book that really resonated with Chris and John, BOUND FOR GLORY: AMERICA IN COLOR. I used some of Dorthea Lange’s depression-era photography as well. The movie was in rural Georgia. 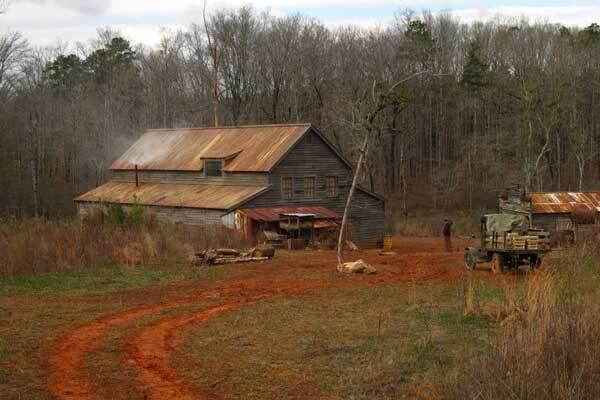 Each town we shot in was roughly an hour or more from each other, and we were about an hour from Atlanta. Having worked there before, I knew that eventually we could have found enough set dressing there to do the film—but it would have taken several people driving the whole state to find pieces one or two at a time. So I enlisted Premiere Props and History for Hire, mainstays from Hollywood, to help me get started with one full truckload of set dressing to take there. It helped us establish Blackwater and gave us time to shop Georgia. History for Hire also helped us with graphics and the jars, newspapers, guns and props. There is a great antique store in Atlanta, Bigger’s Antiques, owned by Karen, Billy and Jeff Bigger. They had a tremendous amount of stuff, and what they didn’t have, they helped us find. It seemed like we were there every day making a pick up. And I had local vendor LG McDonald bring loads of his stuff in from Northern Georgia…things we were unable to find elsewhere. LG was also instrumental in helping me find parts for the moonshine stills. 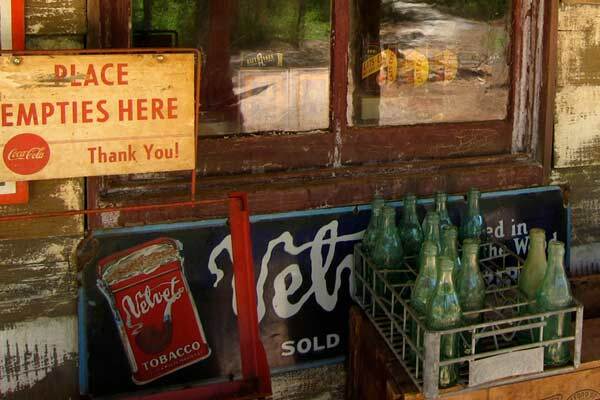 Once we got going and met many of the small town antique owners or residents of the small towns we were shooting in, a phone tree system developed naturally…particularly if we were looking for specific things. Location owners also helped us a great deal. I had built a working still years before, for the film THE PEOPLE VS. LARRY FLYNT…Chris had a Foxfire handbook which illustrated how to make one, and we had a bunch of prohibition research that showed other kinds of operations, from big to small. My on set dresser, Kip Bartlett, came in early and built Howard’s first still on the riverbed, plus Cricket’s basement plumbing still. Howard’s moonshine was the best in the county because he had a double filtering system, and Cricket was a mechanical savant. His still was made with car pieces, parts and filters. I think it actually had a whole front end grill of a car in it. Some parts were fabricated from scratch, but a lot we gathered from moonshine makers in several counties, a feat in itself. It’s not like they are inviting you onto their properties to let you see what they are doing. It’s still illegal and very hidden. Parts are also made from copper which has obvious monetary value, so no one wants to give them up. We found some parts along the way but LG knew some bootleggers and he was able to get us entry onto their land to “borrow” their still parts. If you looked closely, many of the parts had bullet holes in them. After we were around for a time, and folks knew what we were doing there, we pretty much got to try every flavor of moonshine in four counties. That is the truth of the story. 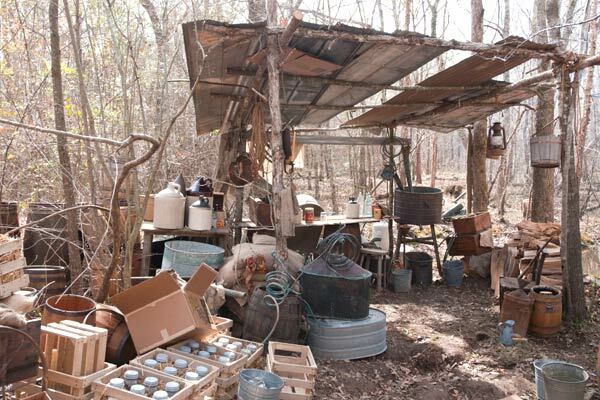 People are really proud of their moonshine. It’s a craft. The Bondurants were proud of theirs…they were NOT fond of out-of-towners trying to move in on their operation and livelihood. 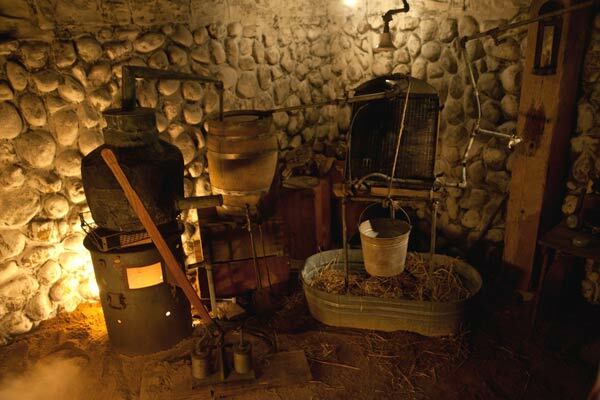 By the time the operation had grown to the vats, the Bondurants were churning out a lot of shine, in barrels and in jars. Those vats were built by construction and taken right out of the research. We added all the extra parts to make them look as if they were working. 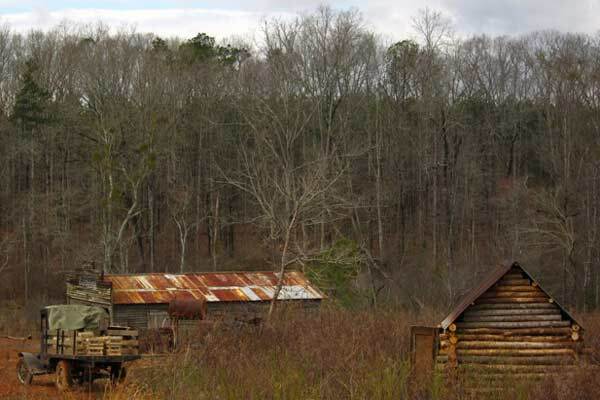 At one point, Chris and Andrew were once again driving and driving through the backwoods of Georgia, when Chris spotted just the tip of a barn peeking out of miles and miles of kudzu in a field. It was brilliant and beautiful. We originally wanted to shoot in that barn, but found out that, logistically, we would never get the equipment back there. Plus, under all that kudzu were random sink holes and wells that could have been very dangerous. 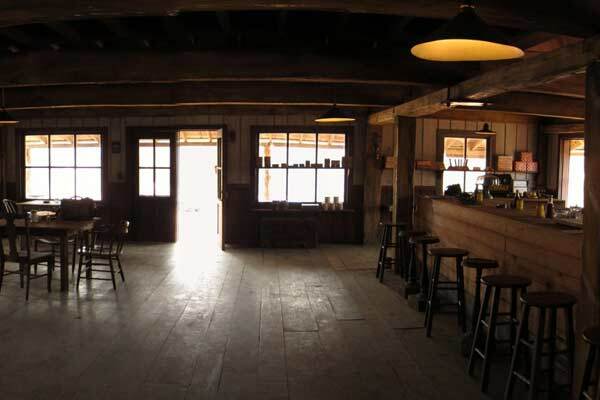 So we shot the exterior and the explosion there, but brought the interior back to a barn which construction refurbished on the Cotton Picking Farm. The funeral party where Jack first sells their moonshine was held in the basement of the brick mill, which we dressed out first as a tobacco drying and packing room. We then set up the wake layered over it. It’s as if they had snuck in and held the wake where they all worked. We made separate rooms with burlap draperies and old metal Anaglypta I found at a flea market. Tobacco was shipped in from Virginia, and we made our own light fixtures and candle holders. We built a plain box coffin but then fabricated an elaborate satin interior for it based on what we had found in our research. Haralson, Georgia served as Rocky Mount, Virginia. It simply wasn’t more than what you saw on camera. A block intersection, it had about four buildings. The feed store was an actual barn that we emptied and dressed out as a feed store. 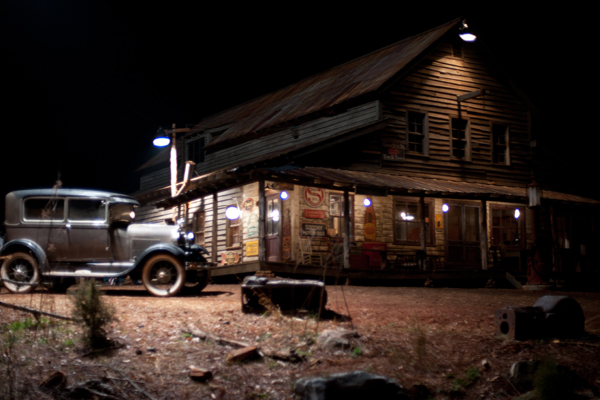 The barber shop was built by construction so that the car could run into it and gangster Floyd Banner could shoot it up. 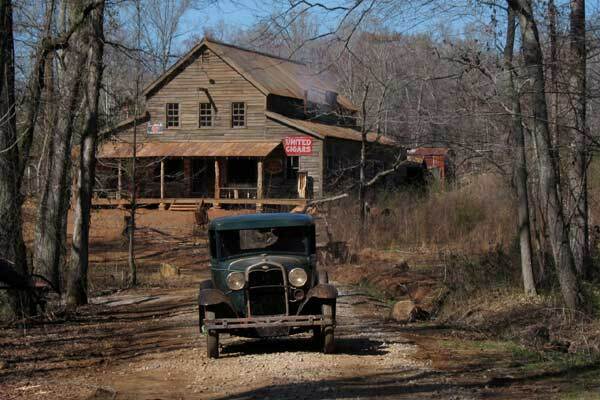 Floyd Banner’s place was filmed in Grantville, Ga. The façade of his building was actually there with the brick archway across the street, which opened into a bit of a field. Grantville has suffered some hard times and almost all of the streets where we shot were abandoned. We resurfaced the road with gravel to hide the blacktop and only added a few light fixtures to keep it dark and eerie. Chris quite liked the fact that Floyd Banner would walk the boys across the street and through the arch to the open grave. We dressed Floyd’s interior in a very old train station building a block away from the exterior. We wanted it to be his office and his gang’s hangout…kept it simple, with just a central table and lighting, his product stacked around the room. 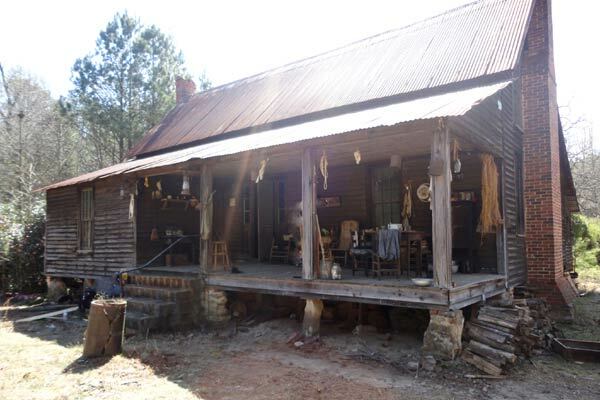 Aunt Winnie’s cabin was an amazing place. 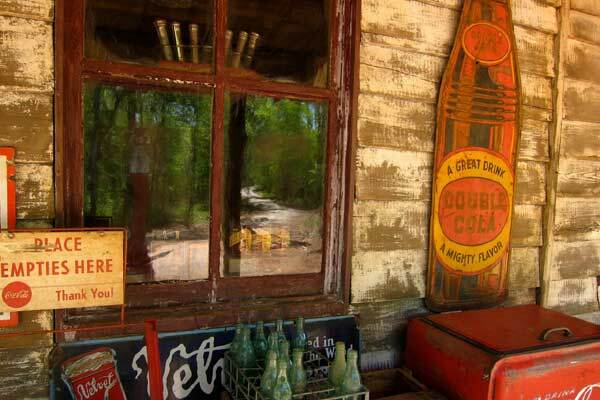 Easily over 100 years old, it was the family property of a man named David Caldwell. His grandfather had been one of eleven, and five spinster sisters had lived in the house for their whole lives without any electricity or interior plumbing. When the last sister died, the house was just locked up. It had suffered a great deal of vandalism, but you could still see little vignettes of their life there. Clothes from the ‘20s and ‘30s hung on ropes across the attic. There were places where their linen handkerchiefs were still folded and sitting undisturbed. But vandals had busted out the windows and it had suffered from some animals and the weather. We cleaned it out and repaired the windows then redressed with some of the original contents and some things we brought in. We added the bathroom to the back porch where Cricket plumbs the moonshine. We buried Cricket in the field next to the house. We made old grave markers for other family members who had died throughout the generations. For the funeral, people were holding just a small bit of wild flowers from the area that we used for a pop of natural color. We only used flowers that could have actually been picked at that time period in that area. I have to say that we just tried to keep true, always, to what would really have happened, what really would have been there. Not to add too much, not to show much abundance of anything, since it was during such tough times. 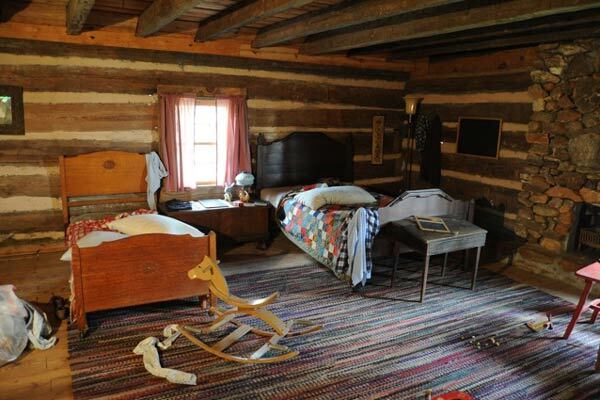 Everything about the decorating was “necessities”…and keeping it simple and as accurate as we could be to the times. That philosophy also created a contrast to the end of the movie, which was a leap forward in time, where we could show some prosperity and introduce more color. 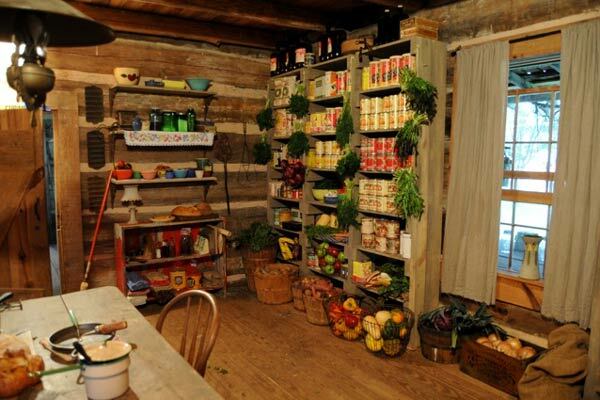 There’s a huge pantry where the jars are full of colorful food instead of clear white lightning. 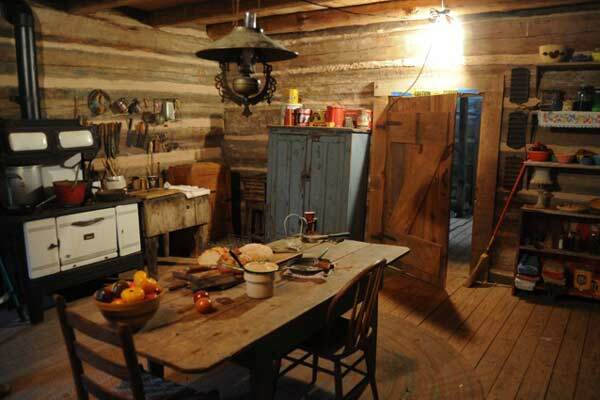 It depicted warmer hues and the comfort of family instead of the starkness of the depression and Blackwater Station. Whenever you are working on a period movie, you have to depend on the talents of your crew and work very closely with other departments. Some things get found that should have been built. Some things get built that can’t be found. 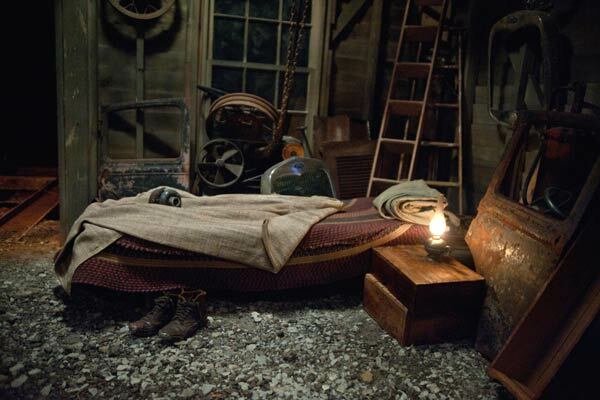 There is a huge overlap between props and set dressing—for this film we worked with the incredible Blanche Sindelar. We all had to depend on each other. Without a lot of money or time, it becomes even more critical. I think everyone who worked on this production really wanted to be there and to make this film. My crew was diverse and had to display many different talents to pull off a movie like this: Justin Pellisaro, Javed and Joshua Noorullah, Joel Klaff, Becky Brown, Dana Corbett, Taraja Ramsses, Bob Smith, B. Wheeler and Rico Long. We also had the skills and talents of Art Director Gershon Ginsberg, Construction Coordinator Scott Pina and Scenic Charge Anne Hyvarnien. The glue that kept us going and really supported our every need while we were moving so fast in such a remote area, was our production supervisor Reggie Robb. I thank them all.